Breathtaking views of landscapes, fauna and flora. 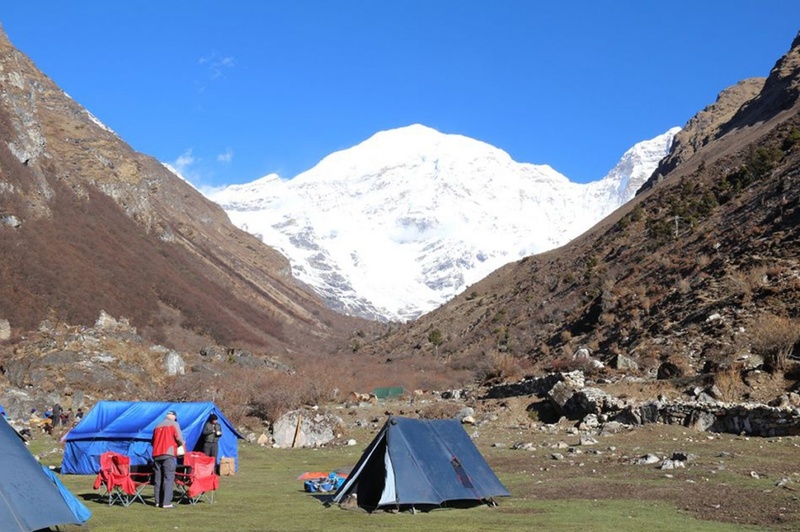 Spectacular view of Mount Jomolhari (Mountain Goddess) from Jomolhari Basecamp (Jangothang). This trek begins at Gunitsawa Village where you pass the army post. At the army checkpost your trek permit (provided by your tour operator) will be checked and endorsed. The campsite is on the opposite side of the river, not far from Gunitsawa. On this long day, the trail continues with several ascends and descends. After an uphill trek through the river valley, the trail narrows gradually to a mere path and then descends to a meadow. This will be your camp for the night. The trail leads to a last settlement in the valley and drops to the Paro Chhu. Passing the lake of Tshophu (4,380m) you will climb up steeply to Bhonte La pass at 4,890 m, the highest point of this trek route. The trail continues through forested areas winding up and down and through a small pass. Langurs (monkeys) can be seen along the way. In Dodena, you will exit the Jigme Dorji National Park and drive to Thimphu.